Beautician removes a clay mask from the face of a young girl in the Spa salon. Beautiful young girl at the beautician does the spa procedures, facial massage and mask for the skin. Slow motion. Spa concept. Hand applying blue mask on female face in spa salon. Spa Clay Mask. Cosmetology. Body care girl's. Skincare. 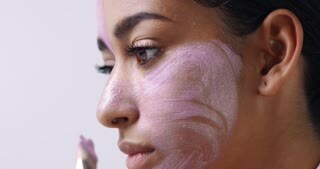 Beautiful woman opens a jar with a clay mask. Apply the mask on her face. Home bathroom. Woman taking bath in bathtub at bathroom 4k. She aplying facial clay mask. 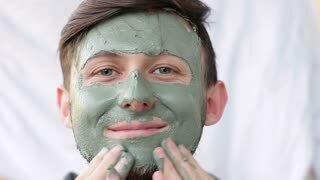 A man in front of a mirror on the face of a cosmetic clay mask. 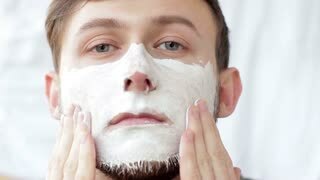 Portrait of a man with a cream or clay mask on his face. 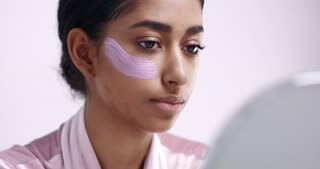 A young woman in front of a mirror applies a cream or a cosmetic clay mask on her face.